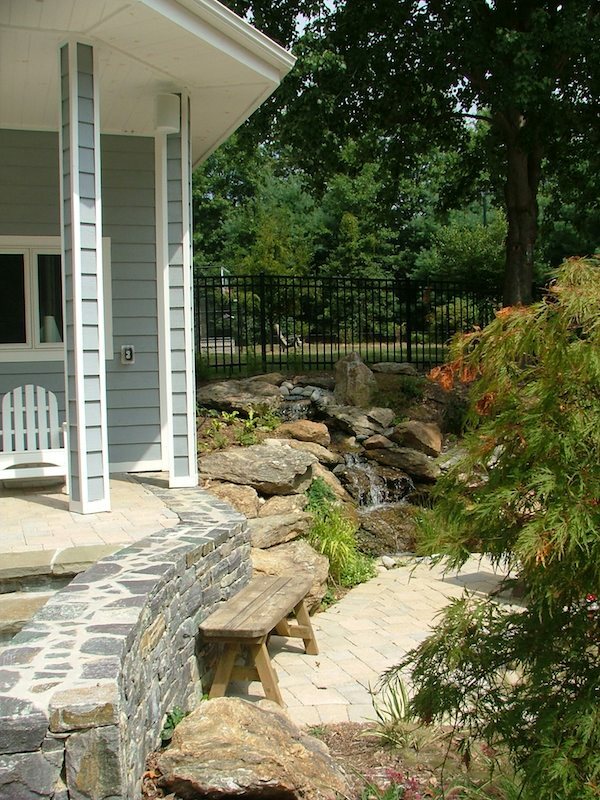 When natural forms, elements, and materials nestle each outdoor room into the landscape it's easy to find a place that fits the mood of the day. 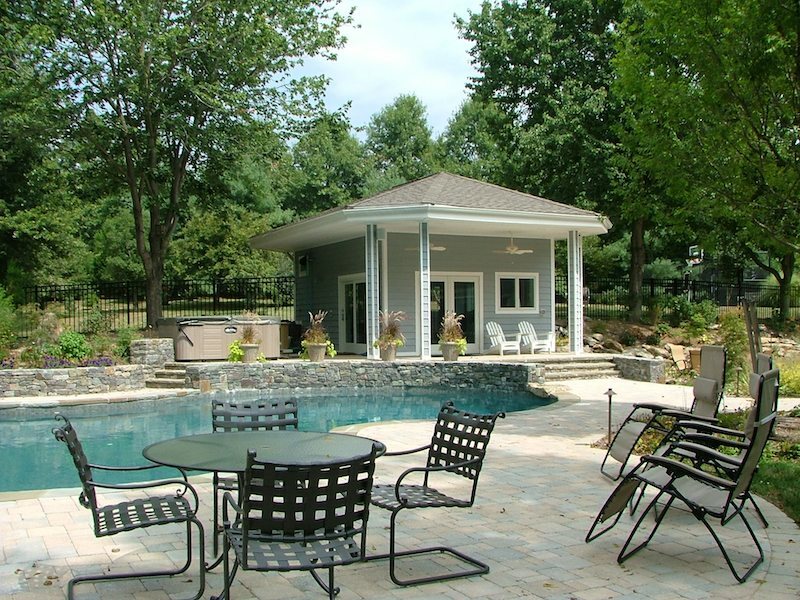 With a pool and spa, pool house, water fall and pond, multiple patios and gardens, and a sport court why would you want to be anyplace else? 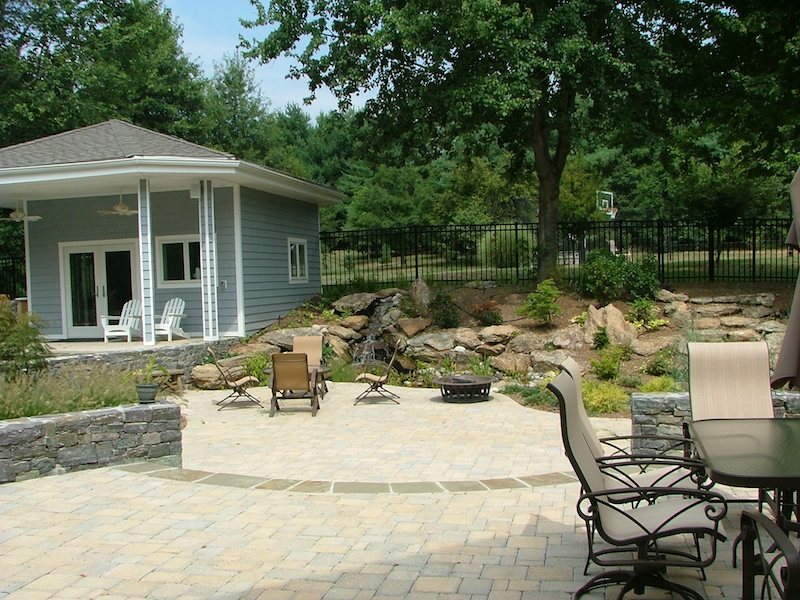 Located in the Howard County countryside of Ellicott City, Maryland. 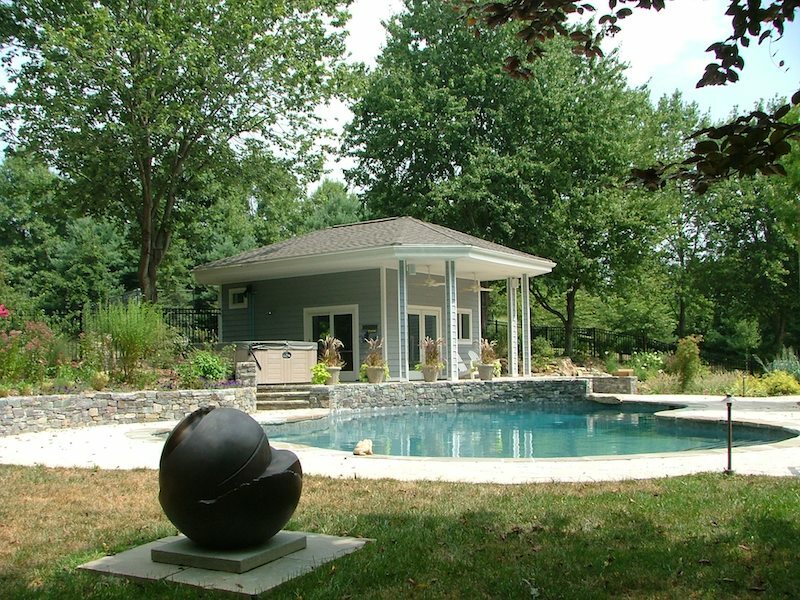 Contemporary home on a large partially wooded lot. House setting on a hill with variable topography. Existing small back deck, a pergola in disrepair and overwhelmed by wisteria, and a sport court. Outdoor spaces and gardens not integrated. Traffic along the back of the property creates a lack of privacy, noise and visual clutter. Create outdoor spaces for dining, entertaining, recreation, relaxing, and contemplation for both large gatherings and intimate relationships. 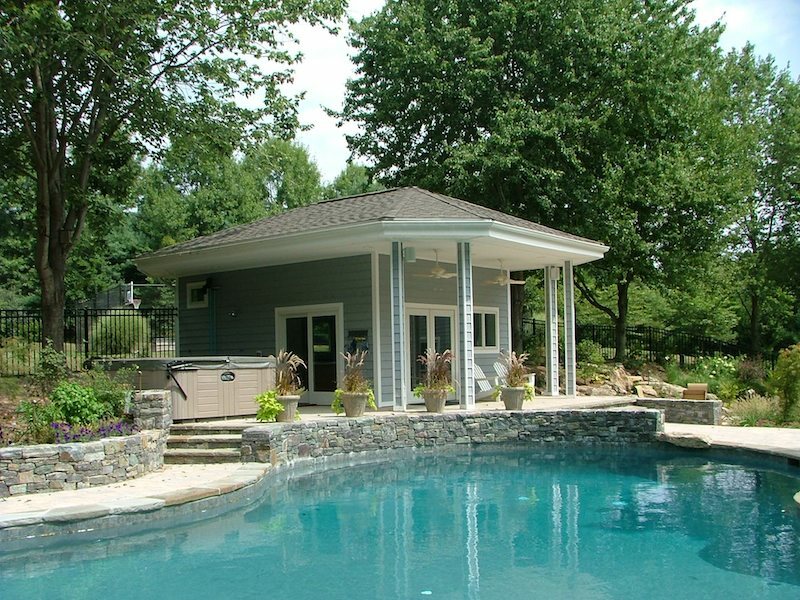 A swimming pool, spa and pool house are to be the focus and center of activity. Create a flow from the house to the outdoor spaces, gardens, sport court and driveway/parking. 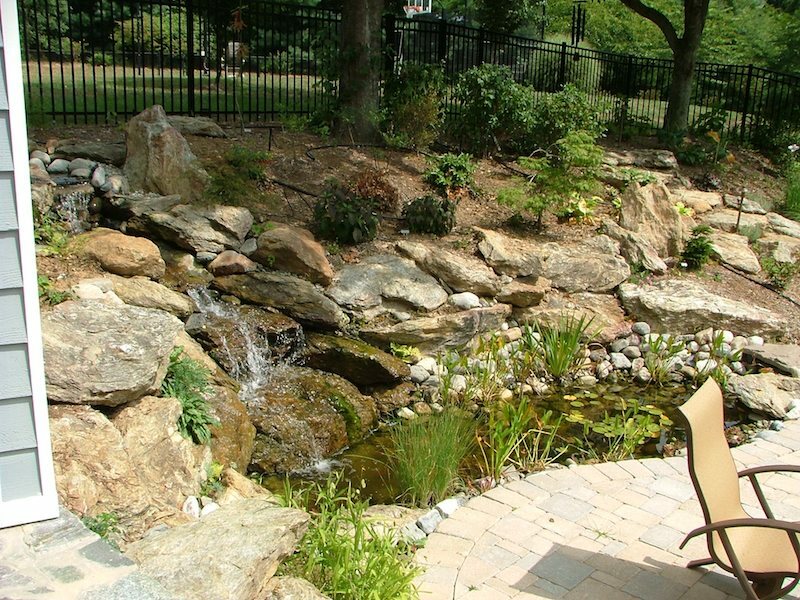 Provide an engaging water feature. Design and materials to be consistent with the contemporary architecture and the natural setting. 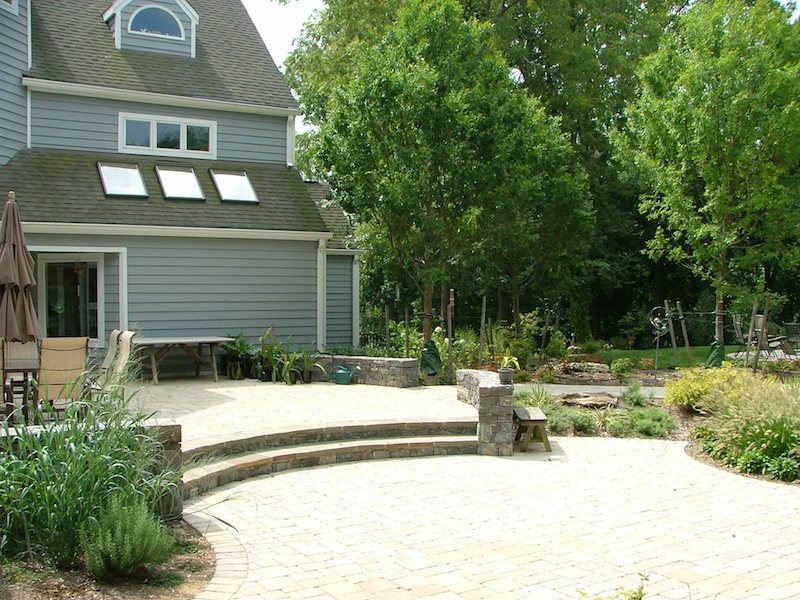 Provide gardens, features and structures to tie the house and outdoor spaces to the landscape. Protect and integrate the large existing trees. 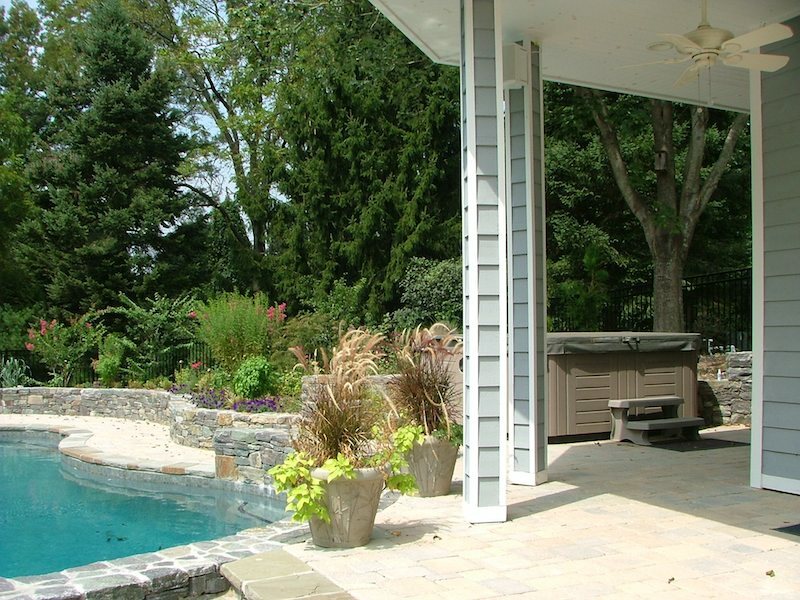 A sequence of organic patio spaces create outdoor rooms for dining and entertaining, lounging around the pool, sitting in the shade on the veranda of the pool house, relaxing by the waterfall and pond, or unwinding in the spa. Water unifies and balances the landscape with an organic pool and integral pool house as the central elements with a waterfall on one side and a spa on the other. 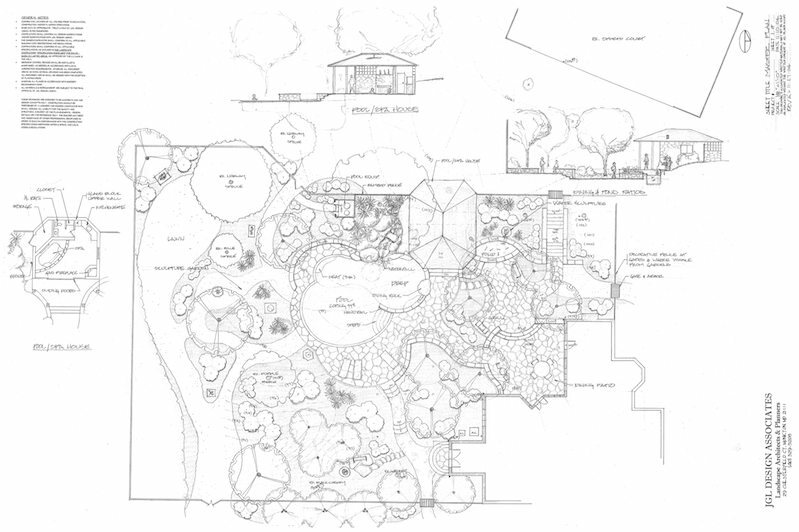 The gardens provide transitions between rooms and integrate the patios and paths with the landscape. The elevated pool house and spa create a place of prominence over the landscape while allowing year round use of the outdoors. The pool house has a kitchen, bathroom, sitting room, storage, outdoor shower and covered veranda with fans and lighting to keep you cool during hot summer evenings. 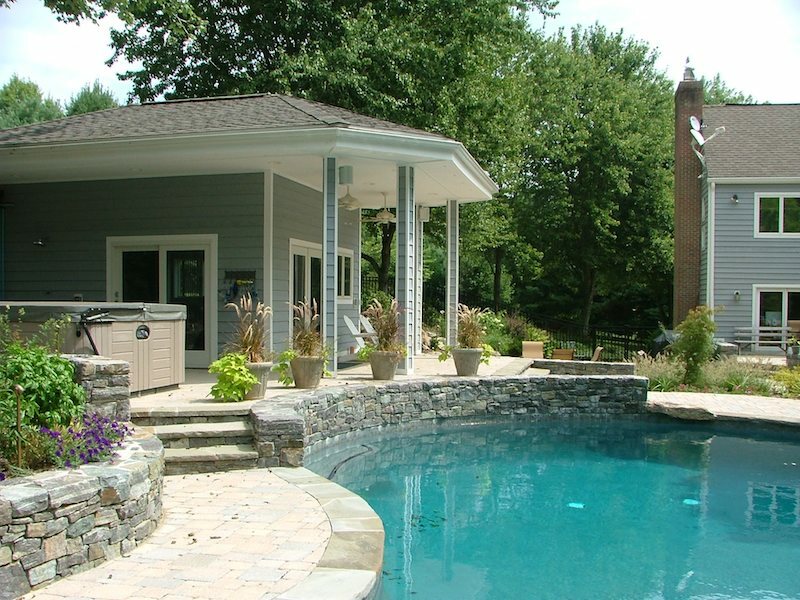 The granite seat walls define and separate spaces, provide seating, and create an edge to elevate the pool house above the pool. 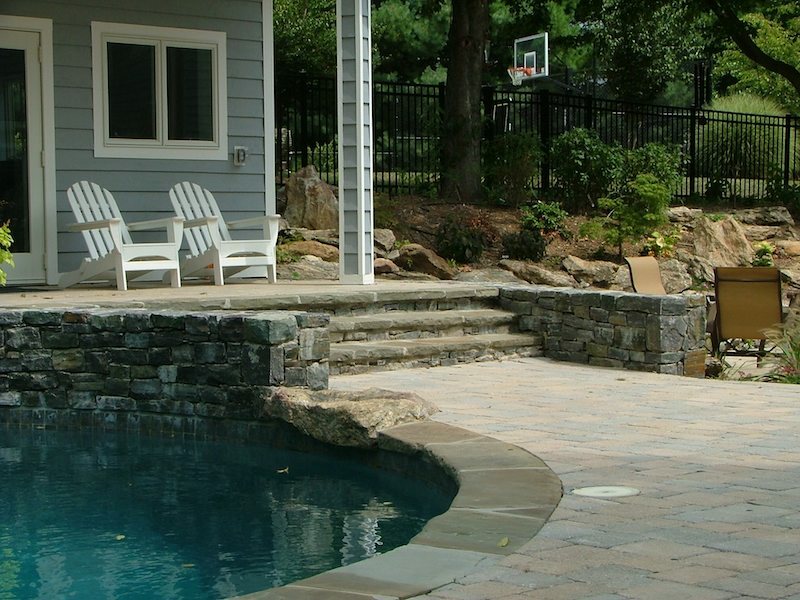 Boulder steps provide a natural transition through the gardens to the sport court at the top of the hill. 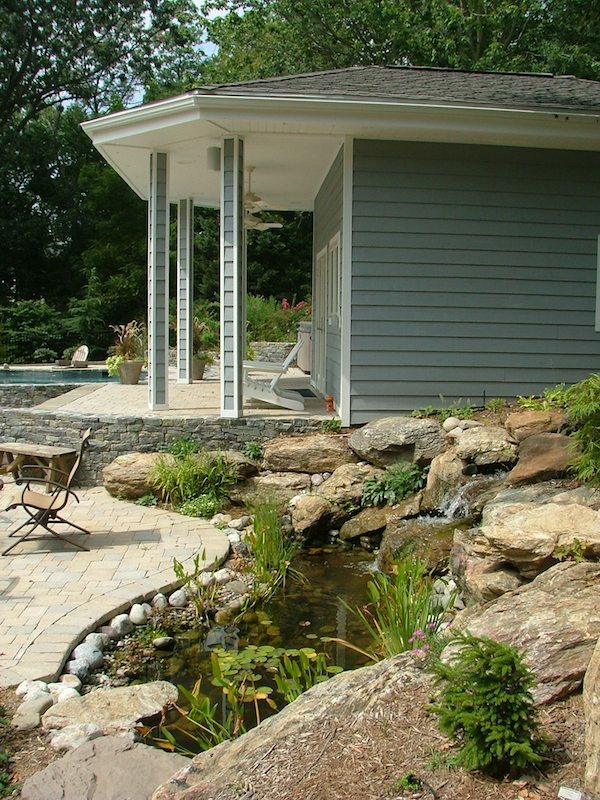 Northbrook Landscape—Patios, Pool House, Stone Walls & Boulder Stair, Pond & Waterfall, Pool Coping, Site Grading & Drainage, and Spa Installation. Abbey Fritz—Ornamental Fencing & Gates.